In wireless sensor networks, a sensor node broadcasts its data (such as routing information, beacon messages or meta-data) to all its neighbors, which is called local broadcast. A general case for a sensor node to use a local broadcast is to advertise its routing information. Considering that sensor networks are vulnerable to a variety of attacks and current routing protocols are insecure, a sensor node’s broadcast message should be authenticated by all its neighbors. Unfortunately, the previous work on broadcast authentication in sensor networks mainly concentrates on broadcast messages from a base station which has greater capabilities, not from a sensor node. Those schemes’ properties are not appropriate for broadcast authentication of sensor node’s routing messages. 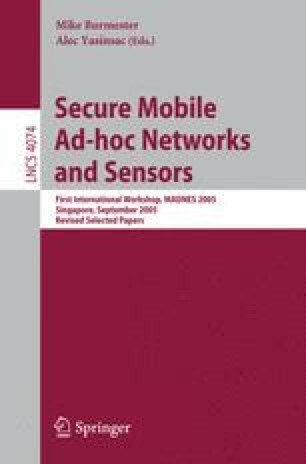 In this paper, we present ARMS, a protocol for broadcast authentication of sensor node’s routing messages. It requires only a small memory space, authenticates routing messages without delay (thus, no buffering is needed), needs no time synchronization among sensor nodes, and mitigates the effect of packet loss. These ARMS’ properties are suitable for a sensor node to broadcast an authenticated routing message.